If you decide to visit the most beautiful city on the Mediterranean - Dubrovnik,the seaside Villa Mediteraneo with private pool,jacuzzi away from the noise and traffic is right place for your holiday. 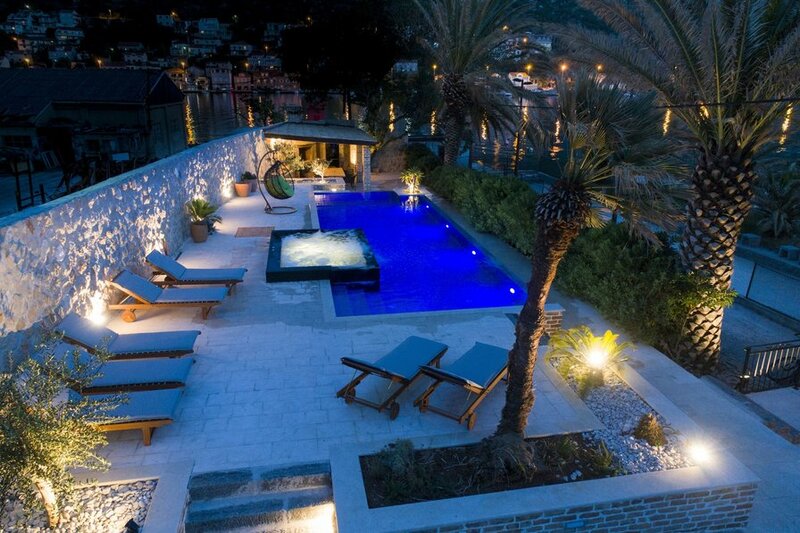 This 5 bedroom historic and spacious stone villa was built in 1802 as a family mansion of old Dubrovnik. In 2011 it was fully restored to become a luxury villa.The interior has been designed by a famous Italian designer and furniture is signed by well-known designer brands such as ‘Selva, D&G, Marchi, Cucine, and Fratelli Mascheroni’. The entire interior is a mixture of modern and old English style, perfect for a luxurious space.On entering the villa you will find the living area decorated with unique furniture, armchairs, decorative cabinets, flat screen TV with satellite channels, CD player, and DVD player. From here there is direct access to the front garden. The adjacent dining area offers seating for up to 10 guests.The villa has wireless internet connection. A fully equipped kitchen which is separated by a small bar features a cooker, oven, fridge/freezer, coffee maker, blender, juicer, microwave, dishwasher, washing machine and clothes dryer. The first bedroom of the villa is also located on this floor with an en suite bathroom and direct access to the front garden.Moving up to the first floor you will find 2 luxurious bedrooms with en suite bathrooms consisting of; a spacious master double bedroom with a fully equipped office with computer, internet access, LCD TV, satellite TV, stereo system, video surveillance, alarm, and telescope. There is also a beautiful furnished terrace where you will find a Jacuzzi and outdoor private pool with amazing sea view. A further smaller double bedroom features an LCD TV, and en suite bathroom.Another 2 bedrooms are located on second floor.The outside area of the villa features a Mediterranean style garden with palm trees and various herbs. The furnished terrace and barbecue offers magnificent views of the Elafiti islands of Dubrovnik, and allows you to experience the joy of al fresco dining. There is also a bowling area within the garden for guests use. At the front of the villa there is a stone-built dock (length of 30 metres) for mooring a boat or yacht of up to 18 metres and which can also be used as a private promenade.The villa also features parking for up to 2 cars.